It has been a month since I flew to California to join the Archangel Tree Climbing Expedition. In the weeks since, I have had time to reflect on the expedition and ponder the future. As I reflect back on the expedition, I realize how lucky I am. The people I met were an amazing collection of dedicated, hard-working, fun-loving, adventurous souls. 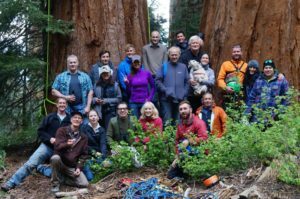 How else could you explain a group that was made up of volunteers who climbed trees over 200 feet high to gather cuttings to make into new “old growth” trees, intended to help avert the disaster we call climate change? It was truly a memorable week to spend with such a remarkable group of people. And what about those trees, the real stars of the week? In the Moving the Giants video, view-able on the Archangel page of my blog, David Milarch talks about “the spiritual, profound, conscious-altering-in-a-positive-way” experience of walking in a redwood forest. It is as if these ancient trees are the guardians of the planet, watching over us even though we humans are unaware; or like being in a natural cathedral that is so magnificent you feel closer to God simply by being there. I actually had a foretaste of that feeling when in April 2016 I discovered a grove of 21 coast redwoods in the Washington Park Arboretum in Seattle, Washington, where I live. This grove is about 80 years old and about 80 feet tall. They are mostly in a circle, so the feeling when standing in the middle of them is like being in Nature’s Cathedral. Their branches almost touch at the top, like a heavenly spire. Below is a short video clip shot from inside that grove. You can hear children’s voices playing nearby. Who, as a child, wouldn’t want to play in a grove like that? As I ponder the future, I think about the planet and how in need of healing it is. The action that Archangel is taking is very inspirational. What David, Jared and Jake Milarch have accomplished with Archangel Ancient Tree Archive has been absolutely incredible. And it has been done with very limited outside support or funding. Last month I was witness to an inspired team of people on the expedition. Along with Archangel’s achievements in cloning ancient champion trees, I am convinced that inspiring people is one of Archangel’s greatest gifts. Inspiring others by taking action is so important! It is critical to the success of any attempt to make significant change in the world! Others besides Archangel have taken inspirational actions as well, such as those featured in the Sources of Inspiration section of my blog. What if Wangari Maathai hadn’t started the Green Belt Movement to plant 30 million trees in Kenya? Then 9-year old Felix Finkbeiner wouldn’t have had a source of inspiration to come up with his idea to plant a million trees in Germany. Without Felix, there would have been no Plant-for-the-Planet organization. Each inspired actor in turn inspired others, who then took action which inspired others. The children leading Plant-for-the-Planet for climate justice recognized how important it was to take action. When their political leaders gave lip service to their cause but took no action, the children spoke truth to power by starting a campaign to Stop Talking. Start Planting. Without the Plant-for-the-Planet initiative led by children inspired by Felix to plant trees for climate justice, the United Nations would not have launched their Billion Tree Campaign, which has resulted in over 14 billion trees planted world-wide. That is a huge benefit to the planet resulting from people inspired to take action. What kind of inspiring action can each of us take? While you are reflecting on that question for yourself, I will tell you what I am planning to do. I am going to be working over the next few months, and longer if necessary, to find a place in Seattle where a grove of Archangel coast redwoods can be planted. I am determined to pursue that goal until I have accomplished it, just as David Milarch has pursued his goal to collect and archive the genetics of some of the oldest and largest trees on the planet. I invite you, as a reader of this blog, to share your ideas for taking inspiring action. Please enter your ideas in the comment section below or send me an email at inspiringactions4trees@gmail.com so that your ideas can be shared with a broader audience. 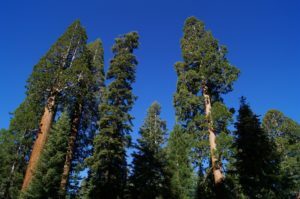 I hope you have enjoyed reading my blog as much as I have enjoyed sharing my stories and photos of the spectacular trees and adventurous people I was lucky enough to meet on the Archangel expedition in California, May 2016. What bubble have I been living in? Until this blog, I hadn’t heard of the Archangel efforts. Thanks for sharing this interesting and important topic. Philip, I was most interested in the tree planting done in Cornwall, and trust they found a sheltered spot to withstand those Atlantic gales. It’s a great project and I hope you find the right place to begin in Seattle. Keep us posted about your progress finding a location in Seattle for the Archangel redwood trees to be planted. That’s exciting!